Ah, engineers! What is not to love about them? They get to use the guns, they have a ton of crazy weird inventions in the form of skills and most importantly, they have the monocles! The way I would describe the engineers would be as "the swiss knife" of the professions. You have a problem, they have some invention to deal with it. The drawback of that is that it is too easy to try to pick just the cool toys and ignore other skills that would probably work better with your chosen play style. Let me use myself as a practical example of what I am talking about. I chose pretty early on that I wanted my character to primarily use a flamethrower. Simply because I just love the flamethrower that much. My problem was the other utility skills though as I was thinking of them in individual terms and coolness factor, instead of thinking how each one would complement better my choice of weaponry. I was also completely ignoring the elixirs since I was thinking, in a very misguided way, that would be more for some one who wanted to play engineers more in a support role. My skill load out varied as I leveled and it looked like certain skills were superior in themselves. 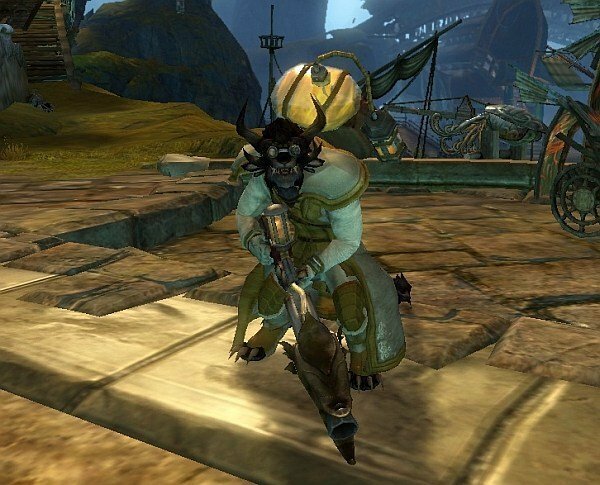 My most used ones were usually the rifle turret, the thumping turret, the battering ram or the shrapnel mine (which is actually a charr racial skill). Mostly due to my thinking of trying to keep the mobs at a distance and having something to aid me in the killing. The problem with those skills is they work better for a build that can actually attack at long range which is not the case of the flamethrower which is a short range weapon. The end result was that as I progressed through the game the fights became increasingly rougher, specially in the personal story where I only had the NPCs to help me out. Back to the subject at hand... At first it took some getting used to that kind of setup but now I think I am getting pretty comfortable with it and I am rarely dying these days. When that happens it is usually because I don't have the space to move, there are way too many danged mobs for me to fights or I am just being stupid. Or all three. It can happen from time to time. Hmmm... I think that is it for now about Kahlef. Next time, Rakuno the asura thief! "Ahhhh, there are gobs of cow in my fur!" I love Maverick, he's such a riot, I chose him too. I think my favorite quote so far has to be "If I ever have cubs all they will have to inherit from me are my good looks, my charm and my charisma." Warrior is a very fun class too! Though I am afraid it is one I might have to pass upon for now as just the charr feel right to play as a warrior on my mind right now (I blame all the beta weekends for it!). It is purely an aesthetic thing but if I am going to play in an imaginary world I might as well have a cool character doing it! Elixir B and Slick Shoes FTW! I finally did WvW last night and those two skills saved my furry hide many times. Especially, Slick Shoes. My Engineer is progressing nicely. But my initial plan to make him a bomb and grenade kit isn't working. Mainly because my traits would be too spread out. So, I'll just focus on Grenades. Full on Explosives to get the Grenadier trait. 20 on Firearms (for the Rifle Range and cooldown) and 20 on Tools (for speed and faster gadget cooldowns). Ah, the bomb and grenade kits are also very fun too! Before I got the flamethrower I would switch to the grenade kit if I had to deal with a group of mobs and then just indiscriminately throw some at them. I still do it underwater some times! I didn't think much about builds for grenades and explosives so I am surprised you are having to specialize in one or the other for practicality purposes. I always thought both would benefit from the same traits considering they are all about blowing things up. Anyway, sounds like an interesting build and if I ever decide to respec I might give that one a try too! They both benefit from Explosives, of course. But you need to be more Tanky when using bombs. So, you have to use Pistol/Shield and spend points on Invention. You can still equip the Grenade Kit, of course. But that would use up one skill slot. So, I'd rather just focus on Grenades, carry a rifle and do my killing from afar. Good point. I didn't consider the issue of the utility skills. I guess I have been playing my thief too much lately and forgetting about those details. Given those circumstances, the grenade kit is indeed the best option. I'm actually going on a different path now. I just found this Elixir Infused Bombs trait that heals your allies through bomb explosions. That's pretty nifty I think. Especially if you WvW a lot. Oh, I didn't know about that trait either! Nifty indeed! Such a cute moo cow!